The 2017 regular season of the National Women’s Soccer League has come to a close. FC Kansas City and the Houston Dash battled to a 1-1 draw, with plenty of chances on both sides. Each side had eight shots on goal, and both Jane Campbell of the Dash and Nicole Barnhart had plenty to do between the posts for their teams and picking up six saves each. Maegan Kelly kicked off the scoring for the home team in the 9th minute, heading the ball to the far post off a feed from Desiree Scott on the wing. But Rachel Daly and some lovely passing from her Houston Dash, including the assist from Kristie Mewis, earned the equalizer early into the second half. After that, it was a battle of epic saves between Campbell and Barnhart. Not to be outdone, Campbell had to come up with one last major save in stoppage time – this time against Brittany Ratcliffe – to earn the point and close out her rookie season. Both clubs will have some questions to answer in the offseason about their head coaches, as FC Kansas City’s Vlatko Andonovki’s contract expired at the end of the regular season, and the Dash’s Omar Morales has come to the end of his tenure as interim head coach. FC Kansas City wraps up the season in seventh place with 30 points, and a solid run of form to close out their season. The Houston Dash sit behind them in eighth place on 23 points. Match ends, FC Kansas City 1, Houston Dash 1. Second Half ends, FC Kansas City 1, Houston Dash 1. Corner, FC Kansas City. Conceded by Jane Campbell. Attempt saved. Brittany Ratcliffe (FC Kansas City) right footed shot from the centre of the box is saved in the top centre of the goal. Assisted by Sidney Miramontez. Foul by Bruna Benites (Houston Dash). Brittany Ratcliffe (FC Kansas City) wins a free kick in the attacking half. Foul by Kristie Mewis (Houston Dash). Nicole Barnhart (FC Kansas City) wins a free kick in the defensive half. Attempt saved. Sarah Hagen (Houston Dash) right footed shot from outside the box is saved in the top right corner. Assisted by Rachel Daly with a headed pass. Attempt missed. Alexa Newfield (FC Kansas City) right footed shot from the centre of the box is too high. Assisted by Shea Groom. Attempt saved. Camille Levin (Houston Dash) right footed shot from outside the box is saved in the bottom left corner. Assisted by Sarah Hagen. Attempt saved. Sydney Leroux (FC Kansas City) right footed shot from outside the box is saved in the top centre of the goal. Assisted by Brittany Ratcliffe. Attempt missed. Kristie Mewis (Houston Dash) left footed shot from the left side of the box is just a bit too high. Assisted by Sarah Hagen. Rachel Daly (Houston Dash) wins a free kick in the attacking half. Substitution, Houston Dash. Poliana replaces Janine Beckie. Substitution, FC Kansas City. Alexa Newfield replaces Lo'eau LaBonta. Attempt saved. Sydney Leroux (FC Kansas City) right footed shot from the centre of the box is saved in the top left corner. Assisted by Desiree Scott. Attempt blocked. Christina Gibbons (FC Kansas City) right footed shot from outside the box is blocked. Assisted by Lo'eau LaBonta. Christina Gibbons (FC Kansas City) wins a free kick on the right wing. Shea Groom (FC Kansas City) wins a free kick in the defensive half. Substitution, FC Kansas City. Brittany Ratcliffe replaces Maegan Kelly. Attempt missed. Sarah Hagen (Houston Dash) right footed shot from outside the box misses to the left. Assisted by Kristie Mewis. Attempt saved. Katie Bowen (FC Kansas City) right footed shot from the right side of the box is saved in the centre of the goal. Assisted by Lo'eau LaBonta. Substitution, Houston Dash. Sarah Hagen replaces Nichelle Prince. Shea Groom (FC Kansas City) is shown the yellow card for a bad foul. Jane Campbell (Houston Dash) wins a free kick in the defensive half. Offside, FC Kansas City. Rebecca Moros tries a through ball, but Shea Groom is caught offside. Attempt saved. Shea Groom (FC Kansas City) header from the centre of the box is saved in the top centre of the goal. Assisted by Rebecca Moros with a cross. Kristie Mewis (Houston Dash) wins a free kick on the left wing. Substitution, FC Kansas City. Katie Bowen replaces Brittany Taylor. Maegan Kelly (FC Kansas City) is shown the yellow card for a bad foul. Foul by Maegan Kelly (FC Kansas City). Foul by Camille Levin (Houston Dash). Attempt saved. Janine Beckie (Houston Dash) right footed shot from the right side of the box is saved in the centre of the goal. Assisted by Kristie Mewis. Attempt missed. Nichelle Prince (Houston Dash) right footed shot from outside the box misses to the left. Assisted by Andressinha. Attempt saved. Rachel Daly (Houston Dash) left footed shot from the centre of the box is saved in the centre of the goal. Assisted by Kristie Mewis. Attempt blocked. Shea Groom (FC Kansas City) left footed shot from outside the box is blocked. Assisted by Sydney Leroux. Attempt missed. Rachel Daly (Houston Dash) right footed shot from the centre of the box is close, but misses the top left corner. Assisted by Nichelle Prince with a cross. Goal! 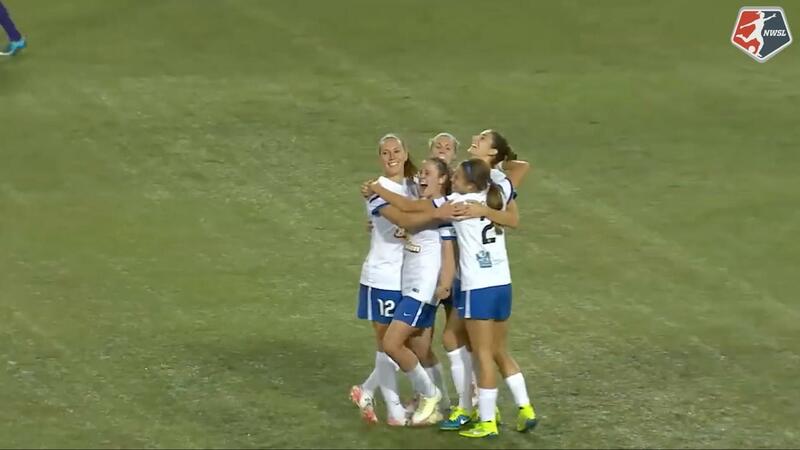 FC Kansas City 1, Houston Dash 1. Rachel Daly (Houston Dash) right footed shot from the centre of the box to the centre of the goal. Assisted by Kristie Mewis. Foul by Lo'eau LaBonta (FC Kansas City). Cari Roccaro (Houston Dash) is shown the yellow card for a bad foul. Attempt missed. Sydney Leroux (FC Kansas City) right footed shot from outside the box is too high from a direct free kick. Sydney Leroux (FC Kansas City) wins a free kick in the attacking half. Bruna Benites (Houston Dash) is shown the yellow card for a bad foul. Sydney Leroux (FC Kansas City) wins a free kick in the defensive half. Kristie Mewis (Houston Dash) wins a free kick in the defensive half. Second Half begins FC Kansas City 1, Houston Dash 0. Substitution, Houston Dash. Andressinha replaces Caity Heap. First Half ends, FC Kansas City 1, Houston Dash 0. Foul by Caity Heap (Houston Dash). Attempt missed. Rachel Daly (Houston Dash) header from the left side of the six yard box misses to the right. Assisted by Kristie Mewis with a cross following a corner. Corner, Houston Dash. Conceded by Sidney Miramontez. Attempt blocked. Nichelle Prince (Houston Dash) right footed shot from the centre of the box is blocked. Attempt missed. Rachel Daly (Houston Dash) header from the centre of the box is close, but misses to the left. Assisted by Cari Roccaro with a cross. Lo'eau LaBonta (FC Kansas City) wins a free kick on the right wing. Offside, Houston Dash. Rachel Daly tries a through ball, but Nichelle Prince is caught offside. Foul by Yael Averbuch (FC Kansas City). Attempt saved. Rachel Daly (Houston Dash) right footed shot from the right side of the box is saved in the bottom right corner. Assisted by Nichelle Prince. Nichelle Prince (Houston Dash) wins a free kick on the right wing. Corner, FC Kansas City. Conceded by Camille Levin. Attempt missed. Caity Heap (Houston Dash) left footed shot from outside the box is just a bit too high. Assisted by Kristie Mewis. Attempt saved. Brittany Taylor (FC Kansas City) right footed shot from outside the box is saved in the bottom left corner. Attempt missed. Nichelle Prince (Houston Dash) header from the centre of the box misses to the left. Assisted by Rachel Daly with a cross. Attempt missed. Cari Roccaro (Houston Dash) right footed shot from outside the box is too high. Attempt blocked. 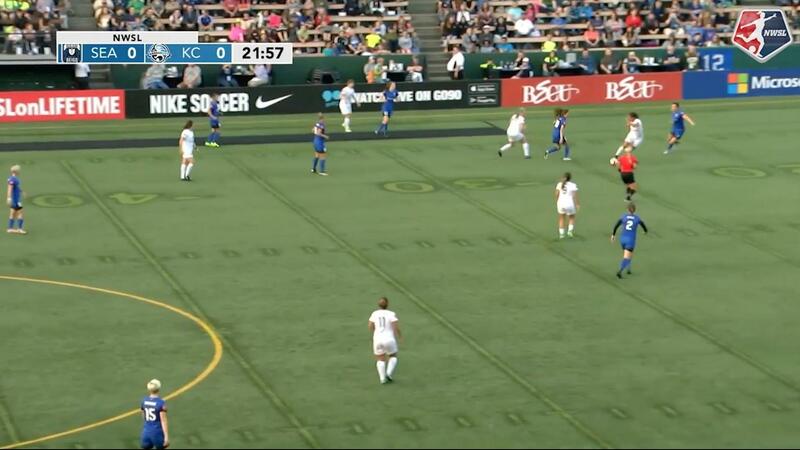 Sydney Leroux (FC Kansas City) left footed shot from outside the box is blocked. Attempt saved. Nichelle Prince (Houston Dash) right footed shot from the right side of the box is saved in the centre of the goal. Assisted by Amber Brooks. Attempt missed. 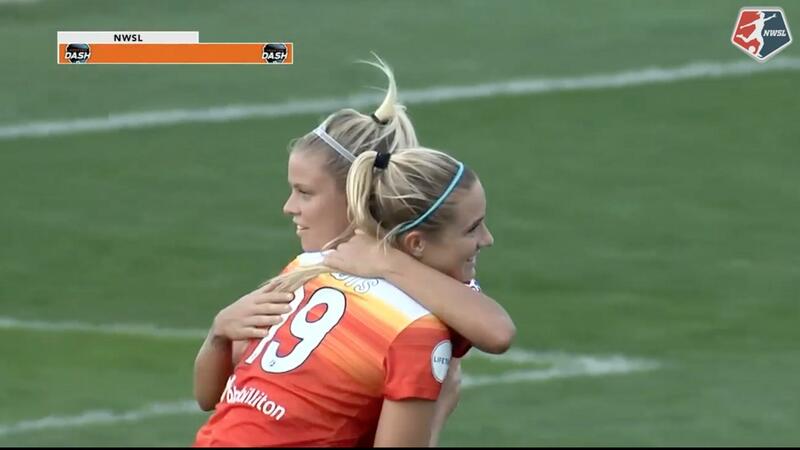 Rachel Daly (Houston Dash) left footed shot from outside the box misses to the left. Assisted by Nichelle Prince. Attempt missed. Maegan Kelly (FC Kansas City) right footed shot from the left side of the six yard box is close, but misses to the left. Assisted by Sidney Miramontez with a cross following a corner. Corner, FC Kansas City. Conceded by Caity Heap. Attempt blocked. Sydney Leroux (FC Kansas City) right footed shot from the left side of the box is blocked. Nichelle Prince (Houston Dash) wins a free kick in the attacking half. Attempt missed. Lo'eau LaBonta (FC Kansas City) right footed shot from outside the box is high and wide to the right. Assisted by Sydney Leroux. Goal! FC Kansas City 1, Houston Dash 0. Maegan Kelly (FC Kansas City) header from the left side of the box to the bottom right corner. Assisted by Desiree Scott with a cross. Offside, FC Kansas City. Christina Gibbons tries a through ball, but Shea Groom is caught offside. Corner, FC Kansas City. Conceded by Claire Falknor. Attempt missed. Yael Averbuch (FC Kansas City) right footed shot from outside the box is high and wide to the right from a direct free kick. Foul by Claire Falknor (Houston Dash). Maegan Kelly (FC Kansas City) wins a free kick in the attacking half. Corner, Houston Dash. Conceded by Rebecca Moros.